Traditional Vietnamese noodle soup is made with beef stock. 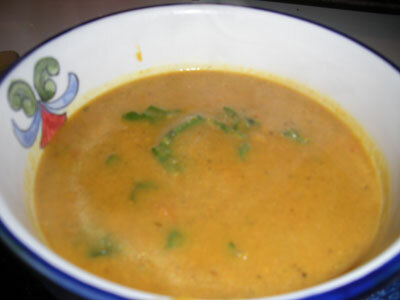 This version uses vegetable stock. Try it when you have a cold: you will be feeling better in no time. 1) Saute onion in 1 tbsp. canola oil and 1 tbsp. soy sauce in wok on medium high heat for 5-8 minutes. 2) Add vegetables (except spinach) and remaining canola oil and soy sauce to wok and sauté 5-8 additional minutes. 3) Add tofu cubes and spinach and stir. 4) Meanwhile in medium-sized kettle, heat vegetable broth on medium-high heat. Add seasonings. Then add pasta and bring to a boil. Cook pasta according to package directions. Reduce heat to a simmer. 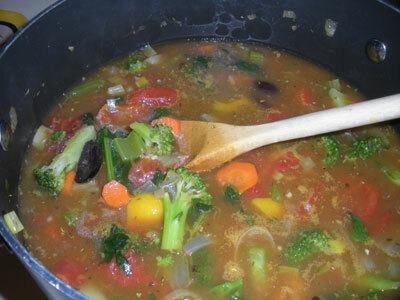 5) Add cooked vegetables to heated broth. Stir and serve. Garnish with fresh basil, if desired. When it’s cold and windy outside, this nutritious soup will warm you inside. 1) Cook onion and leek in olive oil on medium high heat for about 5 – 7 minutes. 2) Add carrot and celery and stir fry a few minutes. 3) Add tempeh (if desired). Add broccoli and stir a few minutes. 4) Add remaining vegetables, garlic and all spices and stir fry until just tender. Add more olive oil if needed. 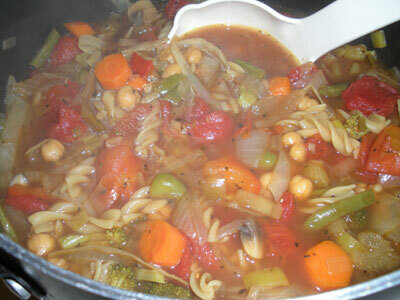 5) Add stewed tomatoes, chickpeas, vegetable stock and about 1 cup of water. Bring to a quick boil. Then reduce heat to a simmer. 6) Simmer for about 20 minutes. 7) Serve steaming hot with crusty whole grain bread or tortilla strips. This is a family recipe that I altered to make vegetarian and lighter. 1) Combine first 6 ingredients and pour into glass baking dish. Sprinkle with vegetarian bacon or smoky tempeh. 2) Bake at 350 degrees for 35 minutes. 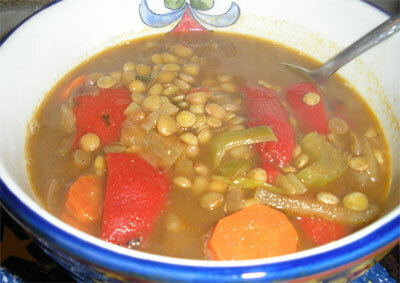 This savory lentil soup is delicious served with crusty whole grain or pumpernickel bread. 1) In medium kettle, heat about 2 tbsp. olive oil on medium-high heat. Add onions and sauté 5-8 minutes. 2) Meanwhile rinse lentils in a colander. Drain and put in separate pot, cover with water. Bring to boil and reduce heat to a low simmer. 3) Add leek, celery and carrots to the kettle with the onions and sauté a few minutes. Add garlic and sauté. Add more olive oil, if needed. 4) Add all seasonings and stir. Then add in the vegetable broth. 5) Add in the lentils. Bring to a boil and reduce heat to simmer. 6) Stir in the roasted red peppers and a drizzle more olive oil. Simmer on low heat about 15 additional minutes. The holidays are over. You spent too much. You ate too much. Make a big batch of this soup and trim both your wallet and your waistline. 1) Mix all ingredients together in a very large kettle. 2) Bring to a quick boil. Then reduce heat to a simmer. 3) Simmer for about 20 minutes. 4) Serve steaming hot by itself or with your choice of toppings: cheese, sour cream, olives, diced red onion, diced avocado, or tortilla chips. Also makes a great dip. 2) Serve with tortilla dips as a dip or serve as a side dish with a meal. 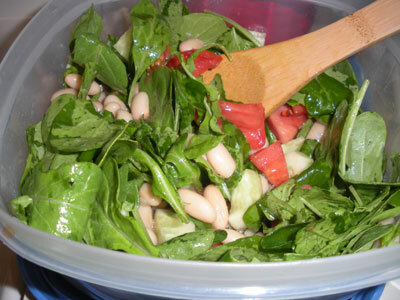 This salad is easy to make and tasty. 1) Cook veggie chicken patties in the oven according to package directions. 2) Peel and slice avocado. 3) Slice veg chicken patties into slices, about 1 inch wide. 4) Mix all ingredients except veg chicken together in a large bowl. Add veg chicken strips on top. 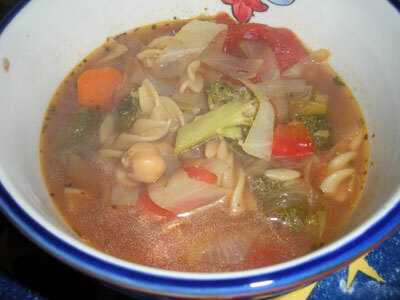 This soup is delicious and a great way to use up vegetables in your fridge. The onion, leek and celery are key ingredients, but after that, you can pretty much add whatever you have on hand or like. 1) Prepare onion and chop leek. It’s okay to use some of the dark green portion of the leek, just don’t use about the top 1/3 of the green part. 2) Heat 2-3 tbsp. olive oil in large pot on medium-high heat. Add onion first and sauté a few minutes. Then add leek and sauté both together about 5 more minutes or so. Add all spices (except red wine vinegar). 3) Add celery, cabbage and carrots and sauté about 7 minutes. 4) Add broccoli, red or green pepper, green beans and mushrooms (mushrooms last) and sauté about 5 minutes more. Add more olive oil if needed. 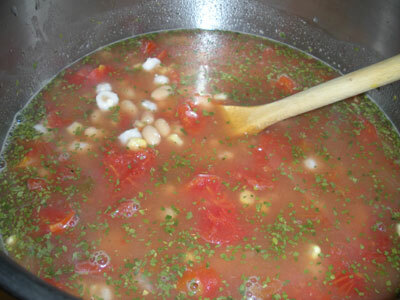 5) Add chickpeas, stewed tomatoes and water. Then pour in vegetable broth. Add red wine vinegar. 6) Increase heat to high and bring to boil. Add pasta and boil about 6 or 7 minutes or until pasta is tender. 7) Reduce heat to low and simmer about 20 minutes more. Remove bay leaf before serving. 8) Serve with fresh bread or crackers. I broke okra crackers into the soup and that was delicious and gave it some crunch. These are hard to find though. A substitute might be a good quality crispy crouton. Makes a big pot of soup. Substantial salad with lots of veggies for your next pot luck. 1) Combine rice, peas pimiento, celery, carrots, artichokes, almonds olives and cheese. 2) Mix together mayo, olive oil and vinegar until well-blended. 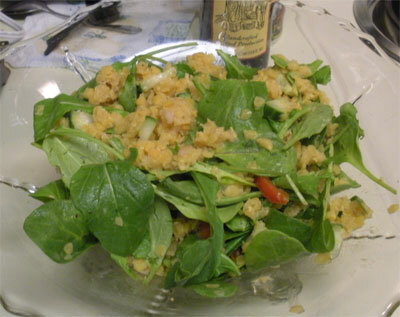 3) Combine salad ingredients and dressing and mix well. 4) Decorate with cherry tomatoes and the extra almonds and extra carrots. My friend Jro made this salad for a dinner club. It was so good, I asked for the recipe. 1) Prepare vegetables and stir together gently in large bowl. 2) Add dressing and mix well. Let set a few minutes before serving. With its vibrant colors, this salad is as pretty to look at as it is tasty and healthy to eat. 1) Slice orange pepper into thin 2 inch slices.Cut strawberries into quarters. 2) Purchase toasted almonds or toast them in preheated 400 degree oven for about 7 minutes. Watch carefully so they don't burn. 3) Mix all ingredients together in large bowl. Add dressing. Let stand about 10 minutes before serving. 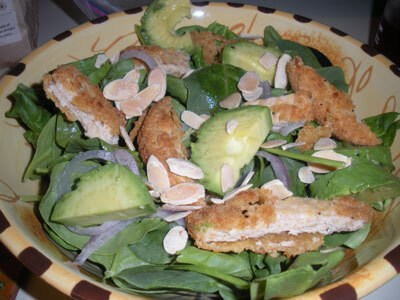 This salad is easy to make, tasty, and healthful. 1) Wash and chop red leaf lettuce. When you need to bring a dish to your Summer party, this pasta salad is a good choice. You probably already have the ingredients on hand and it pulls together in minutes. Also, it’s great for tailgate parties and picnics because it’s mayo free. 1) Cook the pasta according to package directions. Don’t overcook. Drain. 2) Wash and prepare vegetables. 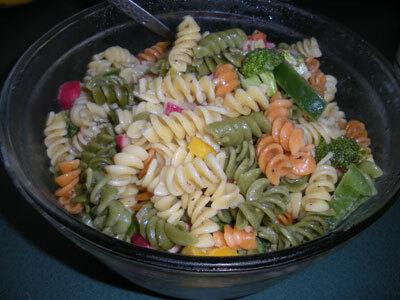 3) Combine drained pasta, chopped vegetables and dressing in a medium-large bowl. Stir everything together. 4) Stir in Parmesan cheese, if desired. 5) Serve right away or refrigerate for about an hour before serving. Keeps for up to a week in the refrigerator. Okay to serve at room temperature. 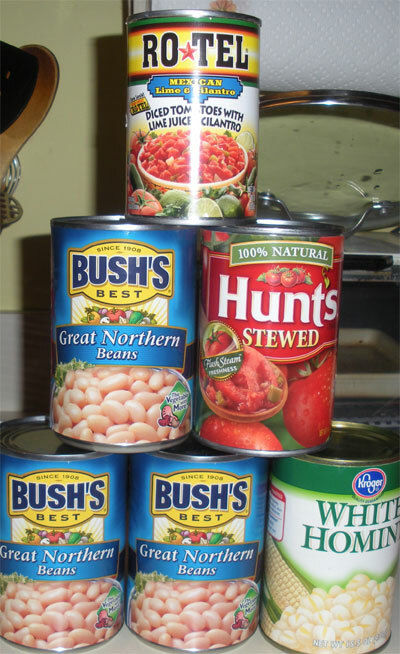 Note: These are the veggies I used, but feel free to substitute your favorite veggies or whatever you have on hand. This salad may sound unusual but it is a hit at our family gatherings. It combines sweet and salty and everyone loves it. 1) Mix pretzels, ½ cup sugar and butter and spread in a 9 X 13 inch pan. Bake at 350 degrees for 10 minutes. Let cool. 2) Mix cream cheese, ¾ cup sugar and whipped topping together. Spread on top of cooled pretzel layer. 3) Dissolve vegetarian gelatin in boiling water and add strawberries. Let it partially set. When gelatin mixture is partially firm, spread it on top of the cream cheese layer. 5) Cut into slices and serve. Peppery arugula adds interest to lentils and peppers in this substantial salad. 1) Cook the lentils according to package directions. Drain. 2) Combine vinegar, mustard, garlic, olive oil, salt & pepper. Whisk these ingredients together. 3) Add all remaining ingredients together with this dressing in a large bowl and stir. 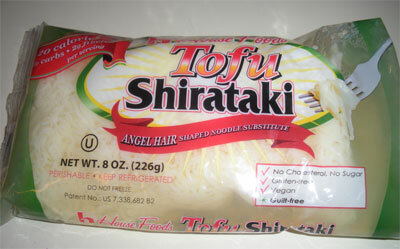 4) Can be served refrigerated or at room temperature. I had multiple servings of this at a recent picnic. Sometimes changing up your potato salad will do you good. 1) Cut potatoes into bite sized pieces; place in aluminum envelope; drizzle with olive oil; and bake 45-60 minutes at 350 degrees. 2) Bake soy bacon until crispy and break into small pieces. 3) Mix all ingredients together. Yum. A delightful vegan cole slaw. 1) Combine first four ingredients together in large bowl. 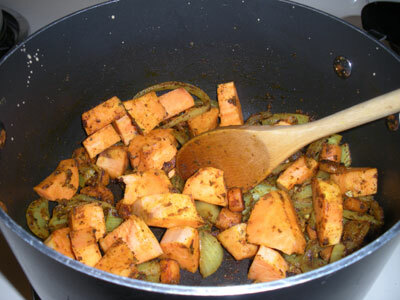 2) Mix dressing ingredients together and stir into vegetable mixture. 3) Chill well before serving. 1) Combine all ingredients and stir together. 2) Refrigerate one hour or overnight. Delicious with Hanover tomatoes or local tomatoes anywhere! 1) Alternate layers of tomato, mozzarella and basil in two rows on a nice dish. 2) Drizzle with olive oil. Great soup for a cold winter evening. Inexpensive and easy to make. 1) Saute onion in butter or butter substitute in cooking pot on medium high heat for a few minutes (until onion is translucent). 2) Add potatoes and water. Cook and stir until done (10-15 minutes). 3) Add milk, salt and pepper, and heat through. 4) Add to bowls and top with cheese, if desired. This recipe makes 4 or 5 servings. Estimate 1 ½ potatoes per person when fixing this soup. This is yummy and refreshing. 1) Beat together cream cheese and sugar. Add strawberries, pineapple, cherries, bananas and pecans. Mix thoroughly, but gently. 2) Fold in Cool Whip. 3) Pour into cupcake liners in muffin pan and freeze. 4) Remove from freezer 15 minutes before serving. Makes about 12 to 16 depends on how full you fill each cup. Calamata olives add punch to this salad. 1) Mix dressing ingredients together and whisk for about 30 seconds. 2) Toss first four ingredients together in a large bowl. 3) Pour dressing over salad and toss. Let sit about 30 minutes before serving. 1) Combine all ingredients and stir. Asian twist on cole slaw. 1) Crunch up the ramen noodles (save the flavor packets) and place them on a cookie sheet with 1 cup of sliced almonds and toast them at 375 degrees for about 5-8 mins (watch them so they don’t burn). Cool. 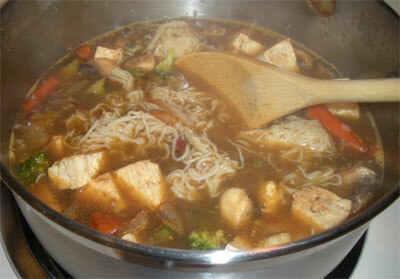 2) Mix together the olive oil, white vinegar, sugar and one of the flavor packages from the ramen noodles. (This is the dressing). 3) Stir together the bag of the cole slaw and the noodle mixture. Add dressing and sunflower seeds and stir. Serve. This makes an elegant, tasty salad. 1) Combine all ingredients except dressing. 2) Add dressing about 15 minutes before serving and toss. Cozy meal for a rainy Spring evening. 1) In a large pot, heat olive oil on medium-high heat. Add onions and stir a few minutes, until onions start to soften. 2) Add carrots, red pepper and garlic and stir fry about 5 minutes. Stir in mushrooms. 3) Add remaining ingredients and bring to a boil. Reduce heat and simmer about 45 minutes. Interesting way to get more broccoli into your diet. Nice side dish for a Summer supper. 1) Combine mayo, sugar and vinegar together. Place in fridge for an 1-3 hours. 2) Mix together broccoli and remaining ingredients. 3) Pour dressing on broccoli mixture a few minutes before serving. 1) Blend all ingredients together. 2) Refrigerate for an hour or overnight. This refreshing and easy to make salad is welcome at any Summer party. 1) Combine all ingredients in large bowl. This sweet potato soup is seasoned with curry and cumin. It is really savory and tasty. 1) In large kettle, heat olive oil on medium high heat. Add onion and sauté a few minutes til tender. 2) Soften sweet potatoes by cooking in the microwave a few minutes. Peel and cut into chunks and add to pot. Also add garlic. Saute a few minutes. 3) Add all spices (don’t add honey or almond butter yet). Stir. 4) Add vegetable broth and water. Bring to a boil and reduce heat. 5) Spoon soup mixture to blender. Do about half of the blender-full at a time. Blend a few minutes. Then pour into a new kettle. Repeat until all soup is processed in this way. 6) Add honey and almond butter and stir. Cook about 10 more minutes. Then serve. If the economy is making you tighten your belt, try this cost-conscious, but delicious slaw. A package of ramen noodles only costs pennies. If you are on a reduced sodium diet, you might want to skip this recipe as the Ramen noodle packet has a lot of sodium in it. 1) Toss all ingredients together. 2) Pour dressing on top and mix. Obviously the longer you wait to serve this slaw the less crunchy the noodles will be, but it is good either way. It will keep in the fridge for several days, but best to make 4 hours prior to serving. This good-for-you salad is easy to make. 1) Mix together olive oil, garlic, salt & pepper. 2) Stir together other ingredients except arugula. Pour dressing over the mixture and stir. Add arugula and stir together. 3) Let sit 30 minutes before serving.